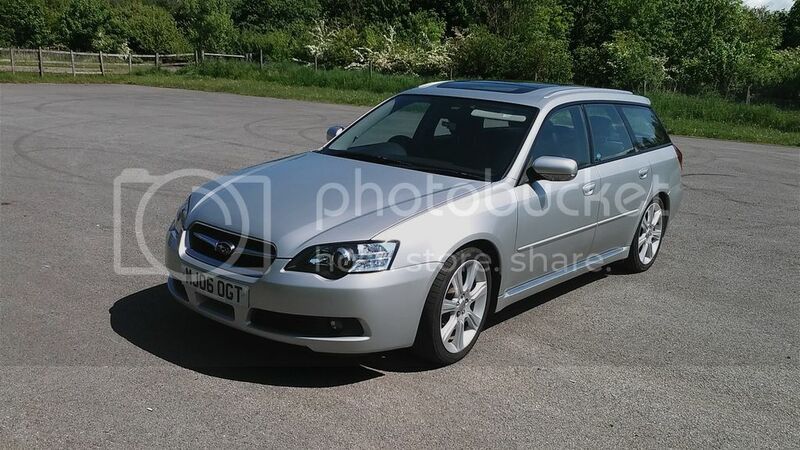 2006 Subaru Legacy 3.0R type B H6 240bhp 24valve - This is a rare and sought after model. I've owned this car since December 2015 and now I'm selling it. Great spec with the H6 engine, 5 speed automatic/tiptronic gearbox, climate control, aircon, touch screen fuel computer / satnav, glass sunroof (that's double usual sunroof size, electric tilt & slide, with sliding sun screen), 18" alloys with good tyres, those alloys cover the bigger 'spec B' brakes and Bilstein suspension, full black leather, removable towbar, brand new LPG conversion (fitted by myself LPGC to similar spec as Rich-R's Subaru that I also converted which is also on this forum), good condition, will be sold with full 12 months MOT. No issues. 9 Service stamps in the book covering from new in 2006 to 2015, it's again just had an oil and filter change (by myself) so I suppose I can put another stamp in the book for a total of 10. The car has covered 111400 miles. This isn't a trade sale, I'm not in the business of buying and selling cars - I am in the business of converting vehicles to LPG and vehicle LPG system repairs, the car is registered to me. It originally came to me for LPG conversion in December 2015 but things didn't quite go to plan and I ended up buying it. Last edited by LPGC on Wed Dec 07, 2016 8:41 pm, edited 1 time in total. As the engine and transmission are identical to my Outback 3.0Rn I can add to Simon's advert by saying that it should average around 27mpg on A-roads, over 30mpg when cruising on the motorway at a constant rpm. Town driving it drops to about 20-22mpg. Those figures on LPG obviously - petrol is maybe 10-15% better as you'd expect. rich r wrote: As the engine and transmission are identical to my Outback 3.0Rn I can add to Simon's advert by saying that it should average around 27mpg on A-roads, over 30mpg when cruising on the motorway at a constant rpm. Town driving it drops to about 20-22mpg. Those figures on LPG obviously - petrol is maybe 10-15% better as you'd expect. Just for other's benefit, Rich is the Rich-R I mentioned above, owner of the Outback with same engine I converted to LPG. Just passed it's MOT with no advisories. As you'll have gathered, the quote is from the ex owner of the Subaru.